← There’s a Mouse in the House. I Think. Hey, betcha didn’t know that today’s World Photo Day. See, you learn all kinds of things here at The Scottie Chronicles. To celebrate, I thought I’d post my very favorite photo. Huuum. That’s going to be difficult. To choose just one photo of the gazillion I’ve posted in the last five years. Oh boy. I remember that trip. It’s the very first time I saw the ocean. And I didn’t quite know what to make of it. These days I much prefer the softer side of life over on the sound side of the Outer Banks. Yeah, the waves aren’t so big, it’s not as noisy, and there are more things to smell. What’s your favorite Scottie Chronicles photo? Hey…remember: if you want to be in a Friday’s Foto Fun sometime soon, send me one of YOUR photos to StuartTheScottie@hotmail.com. 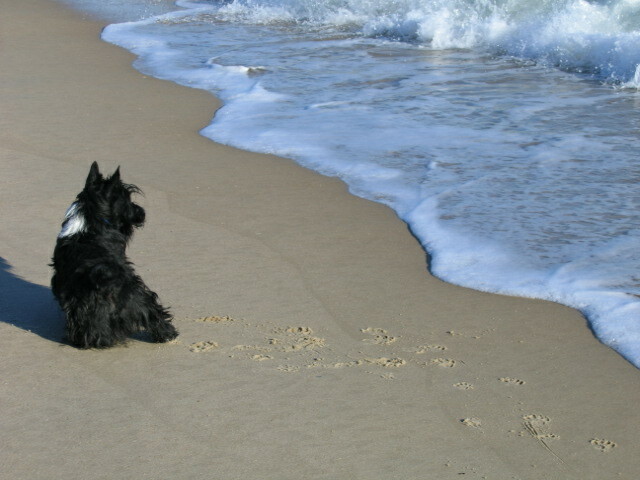 This entry was posted in The Scottie Chronicles and tagged dog photos, dogs, pets, photography, photos of dogs, Scottie pictures, Scotties, Scottish Terriers, Stuart the Scottie, The Scottie Chronicles, traveling with a dog, World Photo Day, World Photo Day 2014. Bookmark the permalink. Ah…the blue pot! Yes. That’s a favorite, too. EYEBROWS!!!! That’s funny. My eyebrows are lookin’ pretty straggly now. I need a haircut. Hey, tell your peep that my peep uses a Nikon Coolpix. She prefers a Canon Sure Shot (I think) but it died years ago. Such is life. Good to hear from you my Edgar pal. We love all of your pictures. It is impossible to chose. I like the puppy pictures. You ought to run a “bad picture day”, it would be, um, interesting and it’s something I could win. Never a bad picture of you my love. Hey, send me a picture of you my pet and I’ll keep it on file to have fun with, K? OK-as soon as I dry out. You don’t want a picture of a soggy Scottie. OH MY DAWG!!! That’s funny. And that counts! Hey, you know what? The peep noticed recently that I’ve really torn up that thing. Bites marks and hanging rubber off the side. LOL….ROFL…. Oh me, I’ve gotta lauging. We prefer to see your handsome face, but the one you like is very cute. We haven’t seen the ocean, and would probably be scared of the waves. All of your photos are nice, we can’t pick just one. Handsome is as handsome does. But it are too hard to choose a favorite. It was hard for me too, my friend. Thanks! It was really hard to choose one picture, so we chose two! They’re both from February of 2013. The first was on Feb. 20th – a Watercolor Wednesday where you are standing magnificently on leash, with your dog tags showing. Beeee-u-t-ful! The other was on Feb. 28th – another Watercolor Wednesday of you in a travel crate in a car. The look on your face and the position you are in is faaaab-u-lous! February must have been a good years, yes? Mom says she loves this one with your foot prints in the sand. We haven’t been blogging long enough, but there is NEVER a bad photo of you Stu! Love this photo of you, Stuart! It’s a winner! If I were on Facebook I’d LIKE it for you! Way to go!